Bodies surrender to child-bearing, forever changed. In the curve of the neck - strong. Reflected in the photo frames. At the torso releasing to the call of music. Like a spring that needs release. I am processing a lot of things these days. Normally I would write here to help me process, but while I am very honest here about adoption and parenting, these current topics are a bit too personal to explore in public. I have been using this blog for so long as my one-stop-shop for exploration, confession, and mucking my thoughts about, that not having it be an appropriate place to process leaves me feeling a bit displaced. I might have to dust off the paper journal and pick up a favorite pen. So, in general summary, we are pretty settled on having this baby by c-section. I had a wonderful, natural birth experience with The Sprout that was everything I wanted it to be: empowering, revelatory, deepening, spiritual, and...well, words fail, really. Also in my birth experience with her, some complications developed that resulted in a lot of trauma and a long and painful recovery that was both physically and emotionally difficult. I didn't write about it much, as it was so personal, but it was a very difficult time. To make a long story go longer, I ended up with an OB here, rather than a midwife, even though a midwife would be more my style. The OB has emphasized his strong opinion that the safest way for me to have this baby is via c-section. My General Practitioner is in full agreement. Wanting to have the opinions from "both sides", I consulted a home-birth midwife with 30 years experience. Her council was that I could try for another natural birth and with months of preparation and the prospect of some intervention, she thought we could minimize the complications that arose last time. So, after mulling it over for several weeks, and talking to God about it, I think having a c-section is the best choice for me, and our family, in these circumstances. I am not comfortable with the idea of surgery, never having spent any real time sick or in hospital. But, I'm processing it. Believe me, I've only given you the surface skimmings, though it may not seem like it. The other thing I'm processing but not discussing (hehe), is the role of our faith in this move, and what we expect to happen here. I realized this week that it's like we were following the pillar of fire/cloud in the dessert, and then it disappeared. Sometimes there's nothing like asking "why are we here?" to start to remember. In other pregnancy news, I'm starting to remember things about pregnancy that I'd forgotten. Last week I was just a little fat. This week, I am surely pregnant. I "popped out", as they say. It's little things that I forgot, like the way sometimes you bend over and your muscles catch there and when you stand up, they don't release! Then you're kind of stuck half bent over, trying to get the muscles to un-glitch. So graceful. Lastly, I feel like I've surrendered my voice for adoption here lately. 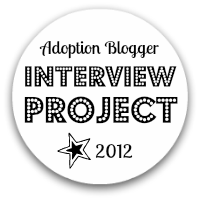 I am not in the process of adopting, nor do I live in the States where my opinions on adoption reform are relevant. Sometimes I forget that as an adoptive mother, I have a permanent stake in the world of adoption, even if I am not currently engaged in it. I've read two pieces lately that really moved my heart and reminded me of what I am passionate about in adoption. The conversation about adoptive parent's "claiming" a baby in a pre-birth match, over at Dawn's, and Heather's discussions of creating inventive ways to make sure adoptive parents are meeting their own ethical standards when adopting in states that have Termination of Parental Rights and Revocation Period time-frames that they don't feel are adequate and ethical. Reading these two discussions has been intensely engaging and I am reminded of how much I care, and how interested I am in being involved in adoption in America, and the world. I think I had to shelf that for awhile, after finding out we can't adopt right now. But I think I might rejoin the conversation soon. So there you have it: there are the visible tips of the icebergs. Now I'll have to go plumb the rest of the depths on my own. This may not come as a surprise to you, or more likely, you'll never even know I posted this, because the truth of the matter is, readers are dropping like flies from my blog. There are still a few faithful, and I love each of you! I've been thinking about what's going on and I think there are a couple factors. First, well, I haven't been writing much. If you want people to read and comment, it kind of helps to give them something to read, eh? I do recognize that basic fact. However, this blog being the cathartic medium I've always treasured it to be, means that I don't write stuff just to have a post up. I write something when I have something to process, or something to say. It's not that I haven't been processing lately...I actually have a lot on my mind. For some strange reason, that goes beyond all of the history of my personality, I am processing inside. My inner processes aren't often surfacing in conscious words and lines of thought, they are more like the currents, under the surface of the water. I always process out loud. Lately, I'm not emailing my girlfriends, I'm not even really trying to talk to The Captain. I've been journaling a bit, but what is happening in me seems so private. How odd that as I write this, I don't even know what I am talking about! Okay, that's not entirely true. There are two issues which are very personal, or very painful, that aren't public material, but in general there's just a lot of undeveloped processing happening inside of me. So, that's the bit about my thoughts being stuck inside and not coming out. The other bit is that my blog is lacking definition right now. It is not adoption-focused enough to draw the adoption crowd, and the same is true for parenting, and ex-pat-living, not to mention our ex-pat experience isn't really exciting enough to draw those readers. Since I write a little bit about a variety of things, I'm not pulling any one crowd, and I'm not gaining new readers. Then there's also the very real possibility that I've turned people off somewhere. So, what do I do? I don't want to shut my blog down, but this internal processing is really cramping my style. I don't want to go on a post-a-thon, trying to draw readers. And I don't want to go out fishing for readers. Kind of sounds like I'm really not that passionate about keeping this thing going, doesn't it? The thing is, life is seasonal, and for me, blogging is too. I think I am in a quiet season where I am going deep, in order to get ready for what comes next. It's like a long inhale, before I start sprinting. I feel like I need some time to close my eyes, and listen to the stillness. So, maybe a blog sabbatical? I'm just afraid that if I go away entirely for a period of time, no one will be here when I come back...and that would be too bad because I really like sharing this here, with you. Just a couple thoughts...the ones that made it to the surface, at least. Mayhem Mama (http://mayhemandmagic.typepad.com/mayhem_and_magic/) has this article up on her blog and I think everyone should go read it. Being Black in America, and the world does affect how you live. Read it. ps-what is wrong with my hyperlink! Arg. Does an Explanation Void an Apology? I have a bad habit. When I've hurt someone, and I go to apologize, I usually end up trying to explain myself because I think that if the person really understood where I was coming from, they wouldn't have been hurt in the first place. I think it comes partly from my compulsion to have the full truth out there. I don't want to leave someone with misconceptions about what I really meant or intended. I'm about to do that here. Sometimes when I write something, I know that my tone is sarcastic, disrespectful, condescending, or judgmental. Lately I've been struggling with how to acknowledge that, knowing that right now, writing that way is serving a purpose in my life so I am not planning on editing myself in that regard. I don't want to hurt people, and I certainly don't want to convey that I think I know all about the topics I'm addressing. I don't. Before I started blogging, I was talking to a good friend of mine. I told him I was thinking about trying my hand at blogging because I wanted a space to hash out what I was experiencing as an adoptive parent with a transracially adopted child. As wonderful and supportive as my friends were, when I needed to talk about the things I was seeing and experiencing, they just didn't get it. I don't blame or fault them, they just didn't. Instead of holding inside the things that made me angry or curious or sad, I needed a place to lay them out and process. So I came here. I think so many people have already been through much of this process in the course of growing up. They have seen racism and white privilege in action, and have a schema for processing new information. Because I grew up as a home schooled kid living in the country, I didn't have those opportunities. I didn't see those things in action until I became mother to my son and it was very personal. Discovering white privilege, the effects of Colonialism, current racism and stereotyping, discovering that adoption isn't conducted in an ethical manner much of the time, hearing for the first time that many first mothers suffer depression and grief and trauma for years after placement, coming to terms with my role in adoption, learning that many adoptees view adoption as a negative and damaging experience, navigating our semi-open adoption, all while bonding with my new son and parenting my new daughter, has been A LOT to deal with. Honestly, some days I am just reeling from it all. What I spent my whole life believing about adoption, and aspiring to in adopting, has been totally rocked. I have learned and processed more information that affects me emotionally, in the last three years, than I would have ever imagined possible. What I write here is an emotional release for me. After putting things into words I can let them go and move on to what I need to process next. Sometimes what I release is anger. Sometimes it's outrage. Sometimes it's sadness. Sometimes it's fear. When I think about changing my tone to write this for YOU, to offend YOU less, and to garnish more readers through my honey-soaked, carefully weighed and measured arguments, I can't do it. Not right now. Right now I still need this place to come and rant once in awhile. When I went to that school and they were playing music that was created to hurt members of my son's race, that made me angry. That they were playing it, yes, but that that kind of devisive evil is in our world. I need a place to scream that that is not okay. I think I can also come across as aggressive sometimes because I am insecure here. As a blogger I am writing monologues. I can write something so personal to me and have lots of people read it but no one comment. It's like crying in public when no one asks you what's wrong. Sometimes I can handle that, and sometimes I come to the keyboard defensive because I have to get my thoughts out but I'm afraid someone will judge me for it or worse, that no one will say anything at all. I'm sorry if I hurt you here. I'm sorry if I'm rude. I invite you to tell me so. I know that I am not always balanced and as my brother-in-law says in his Italian way, "I know I run my mouth." So, if me running my mouth bugs you, please tell me so that we can work it out. Back to our previously scheduled programming!